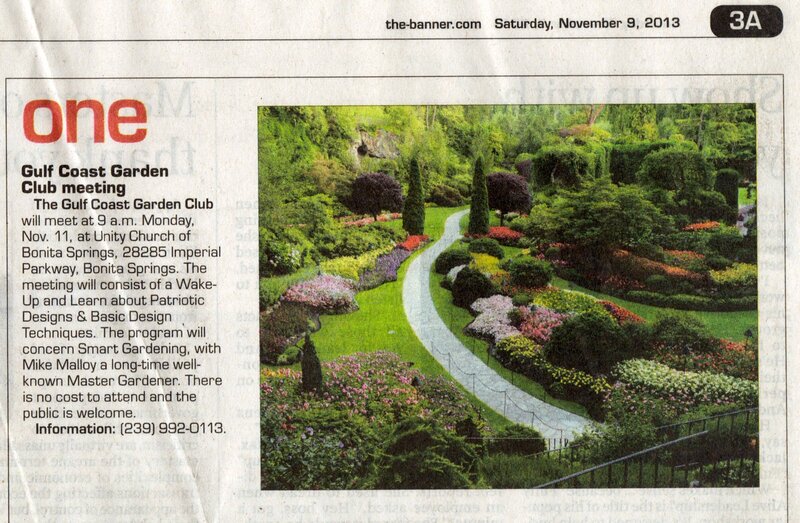 The name of this organization shall be the Gulf Coast Garden Club, a member of the Florida Federation of Garden Clubs and the National Garden Club, Inc. The Gulf Coast Garden Club provides education, resources, local, state, and national opportunities for its members to promote the love of gardening, floral design, civic, and environmental responsibility. Section 1.Membership in the Florida Federation of Garden Clubs, Inc. is open to all regardless of gender, age, race, ethnicity, or religious affiliation. Section 2. Anyone interested in the mission of the club is invited to join by completing a membership application and paying the required dues. Section 3. Active members of the club are those who have a willingness to share in the work of the club, to serve on committees, and to attend meetings. Section 5. A member whose dues remain unpaid after May 15 shall be dropped from membership. Section 2. Dues are payable by May 1st. Federation of Garden Clubs fiscal year begins on July 1st. Section 1. Elected officers of the club shall be: president, 1st vice president, 2nd vice president/program chair, 3rd vice president/membership, treasurer, recording secretary, and corresponding secretary. Section 2. The election shall be conducted by ballot by the members at the March general meeting. In case there is but one candidate for an office, the secretary shall be instructed to cast the ballot. Section 3. The president, 2nd vice president/program chair, and corresponding secretary shall be elected in the even years. The 1st vice president, 3rd vice president, treasurer, and recording secretary shall be elected in odd years. Candidates for the office of president shall have served at least one term on the board of directors. Section 4. Appointed officers of the club shall be parliamentarian, bylaws, member-at-large and historian. The president with the approval of the executive committee shall appoint these officers. Section 5. Officers shall serve for a term of two years. An officer may serve for no more than 2 consecutive terms in the same office. Section 1. Officers shall perform the duties prescribed by these bylaws and by Roberts Rules of Order, Newly Revised. A. President: The president shall officially represent the club at local, regional, state and national levels and shall serve as the president of the Gulf Coast Garden Club. The president shall be responsible for submitting reports as requested by various levels. The president may call a meeting of the board of directors or executive committee to approve appointments, to plan and implement actions, and to establish policies. She/He shall have a signature on file at the bank enabling her/him to sign checks in the absence of the treasurer. A report shall be given at the annual meeting. B. 1st Vice President: The 1st vice president shall act as an assistant to the president, perform the duties of the president in all cases in which the president is unable to serve, and perform such duties as the president and board of directors shall direct. She/He will be responsible for acting as chair of the auditing committee and call for an audit of the treasurer’s financial records annually. She/He will coordinate the production of the annual yearbook, which shall be made available to members by the October general meeting using current technology with cost subject to approval of the board of directors. C.2nd Vice President/Program Director: The 2nd vice president shall assume responsibility for planning and implementing the program. Program plans will be submitted to the board of directors by June 1st. She/He shall perform duties of the president in all cases in which the president or 1st vice president is unable to serve. D. 3rd Vice President/Membership Director: The 3rd vice president/membership director shall be responsible for promoting membership, maintaining accurate membership lists, providing lists for the annual yearbook, and providing name tags for members and guests. She will chair the standing membership committee and be responsible for all the information and dues transactions with the Florida Federation of Garden Clubs in coordination with the treasurer. E. Treasurer: The treasurer shall serve as the chief officer in charge of all finances including dues and disbursements. The finance committee and the treasurer shall prepare an annual budget for the approval of the directors prior to the March meeting. The treasurer shall present the proposed budget for the upcoming year to the membership at the March meeting. The proposed budget will be publicized to the members prior to the April general meeting and approved at that meeting. After approval the budget shall be printed in the next yearbook. The treasurer shall make a written report of all receipts and disbursements at each meeting. At the annual meeting in April the treasurer shall provide a written report properly attested by the 1st vice president. F Recording Secretary: The recording secretary shall keep minutes of the general meetings, board of directors meetings, and executive committee meetings. The secretary shall have available at all meetings a copy of the minutes in current and previous years; a list of club officers and chairs; a list of current members; and the Bylaws. G. Corresponding Secretary: The corresponding secretary shall conduct all correspondence as directed by the president, executive committee, and the board of directors. The corresponding secretary shall be a member of the publicity/public relations committee and coordinate internal communications in all forms. H Parliamentarian: The parliamentarian shall insure that meetings are conducted in accordance with Roberts Rules of Order, Newly Revised. I. Bylaws Chair: The bylaws chair shall be responsible for keeping the club in conformity with the Bylaws and making revisions as requested. Copies of the bylaws will be available on request. J. Historian: The historian shall maintain a current record of club activities and have custody of all available pertinent past records. K. Member-at-large: The member-at-large, a full time resident, shall serve as an representative to groups at the request of the president. Section 3 Vacancies: The 1st vice president shall succeed to the office of president for the unexpired term should the president become unable to serve. All other vacancies shall be filled for the unexpired term by a majority vote of the board of directors. Section 1. The executive committee shall consist of the elected officers and the immediate past president who shall serve a two year term as an advisor without a voting right. Section 1. The executive committee shall meet at least once per year at a time established by the president. Section 3 the executive committee shall have the power to transact business arising between general meetings and board of directors meetings. It shall exercise such powers and authority as may be delegated to it by the board and shall report to the board on all actions taken by it between regular meetings of the board, and appoint delegates as appropriate. Section 4. Executive board members are expected to attend executive board meetings. If unable to attend a meeting, they are responsible for obtaining information pertinent to that meeting. Section 1. The board of directors shall consist of elected officers, appointed officers, appointed chairs of standing and special committees and the immediate past president. It shall meet at least 3 times per year. Section 2. The board of directors shall have the power to transact business between meetings. It shall review and approve the plans of standing and special committee chairs. Section 3. A quorum shall be a majority of its members. Section 4. The board of directors shall fill any vacancy that occurs among the officers until the next election. Section 5. Special meetings may be called at any time by the president or upon the written request of 6 members of the board or 20 members of the club. Section 1. There shall be at least 6 general meetings of members per year. Section 2. The annual meeting of the club shall be held in April, the exact time and place to be determined by the board. Section 3. The annual meeting shall be held for the purpose of receiving annual reports from the president and standing committees, approval of the budget, and installation of officers. Section 4. Special club meetings may be called by the president or 5 members of the board of directors or at the written request of 15% of club members. Notice of the date, time, place, and businesses to be brought before the meeting shall be provided to the members at least 10 days in advance. Only business for which notice has been given shall be transacted. Section 1. The president shall appoint standing committee chairs as necessary. The chairs shall serve for 1 term of two year beginning after the April meeting and may be reappointed. Section 2. Standing Committees shall consist of at least 3 members, submit a report to the president for the annual meeting, and present a budget request to the treasurer for the following fiscal year in February. officers at the February meeting. Nominations may be made from the floor, providing the person nominated has consented to serve if elected. Elections shall be held at the March general meeting and officers installed at the April annual meeting. B. Finance: The committee chair along with the treasurer and the finance committee will be responsible for monitoring the current monthly budget, as well as unbudgeted expenses over $50.00, and will review approved budgeted line items against actual expenditures. The committee will prepare a proposed budget for the coming year. C.	Programs: The program committee shall be responsible for planning and implementing the club programs. The budget for the coming year shall be submitted to the finance committee. D.	Membership: This committee shall be responsible for promoting membership, maintaining accurate membership lists providing lists for submission in the annual yearbook, and providing name tags for members and guests. The committee shall be responsible for all information and dues transactions with the Florida Federation of Garden Clubs in coordination with the treasurer. E.	Yearbook: This committee shall be responsible for collecting information, layout, and editing of the yearbook. After approval by the president theyearbook will be distributed by the October general meeting. F.	Audit: The 1st vice president, treasurer, and three persons not on the finance committee will conduct a yearly audit and report findings at the April annual meeting. G.	Publicity/Public Relations: This committee shall be responsible for reporting club programs to the media and promoting the club to the general public. All communications are subject to the approval of the president. H.	Ways and Means: This committee will recommend projects to the board of directors, submit a budget, and implement approved projects, and report receipts and expenditures to the treasurer. I.	Hospitality: This committee shall be responsible for obtaining hosts and refreshments for general meetings and other activities as deemed necessary. J. Trips: This committee will be responsible for planning and implementing trips subject to the approval of the board of directors. K.	Education. This committee will be responsible for educational outreach in the community. L.	Design: This committee shall be responsible for design education. M.	Horticulture: This committee will be responsible for horticulture education. Section 1. The president shall appoint special committee chairs as necessary. The chairs will serve for 1 or 2 years and will conduct committee meetings and activities to promote club activities. Section 2. Special committees shall consist of at least 3 members and submit reports as requested from the president or board of directors. Budget requests for the next fiscal year should be submitted to the treasurer in February. Intermittent and unplanned budget requests should be submitted to the president and treasurer. Section 3. The Board of Directors shall appoint an audit committee of 3 qualified individuals either inside or outside the club to serve for one year. The members shall select a chair. The audit will be completed by April 1. Provisions of these bylaws may be amended by a 2/3 vote of the voting members present at any general meeting provided notice is given to every member at least 2 weeks in advance of the meeting. Upon the dissolution of the club, the executive board shall, after paying or making provisions for payment of all club liabilities, dispose of the assets by disbursing these assets to an entity as voted upon by 2/3eds vote of the board of directors. The rules contained in the most current addition of Roberts Rules of Order, Newly Revised shall govern the club in all instances in which they are applicable. This entry was posted in Uncategorized on November 14, 2013 by GCGCwebmaster. Names and addresses of members will not be published or distributed for any reason or purpose other than for national, state, district, or GCGC communications. GCGC Blossoms’ emails will contain garden club related information only. Dues paid by new members who join after March 1st will be applied to the next fiscal year. and all expenditures over $50.00. Special projects need to be approved and budgeted by the board of directors. Written receipts for all expenses must be submitted to the treasurer for reimbursement. In the absence of the treasurer the president may sign checks. This entry was posted in Uncategorized on November 11, 2013 by GCGCwebmaster. Several Gulf Coast Garden Club members attend the Council meeting on Friday. This entry was posted in Uncategorized on November 10, 2013 by GCGCwebmaster.